New California Lions website is now launched. As discussed this past weekend at the Fall Council of Governors meeting in Santa Maria, a new, additional website has been developed to showcase the Lions of California specifically to non-Lions. The website describes the Lions Clubs of California as who we are by what we do, promoting: City of Hope, Lions in Sight, Lions Eye foundation, California Lions Foundation, Lions Clubs International Foundation, Lions Float, Inc., and similar partner associations. Note that acronyms such as MD-4 are not present in this public targeted Lions Clubs promotional effort and that the text and photos are intended to appeal emotionally to a younger audience. The Council of Governors this past weekend authorized that the new website be launched today, as-is, to the 20,000 Lions of California. As a measure of success, we will monitor whether additional not-for-profit and for-profit business partners will request inclusion on our website going forward. We will also track the quantity and track the number of website hits and how long users spend on the site and on each page. The end game is to use the website as a marketing tool with California corporations to entice to partner hand-in-hand in community service including monetarily and in new Lions Clubs We want their logo on our website and the Lions logo on theirs. Enjoy a Kings game with your fellow Lions club members on Thursday, November 9th. Join us in celebrating the selection of Lion Pancho Sanchez as our Elk Grove Citizen of the Year. Tickets will be available from the Chamber of Commerce. Every year, the people of Elk Grove honors an Elk Grove citizen who has contributed greatly to our community and is an example of the meaning of giving. Since 1955, representatives from different Elk Grove community service organizations have presented this annual award honoring an area resident who has rendered outstanding services directly to the Elk Grove community. For 2017-2018, the committee has selected another Elk Grove Lion to be honored as the citizen of the year at the awards banquet on November 6th. Please join us in congratulating Lion Pancho Sanchez and the Elk Grove Citizen of the year. Look at the list below and you will find that 25% of the people selected over the years are Lions. 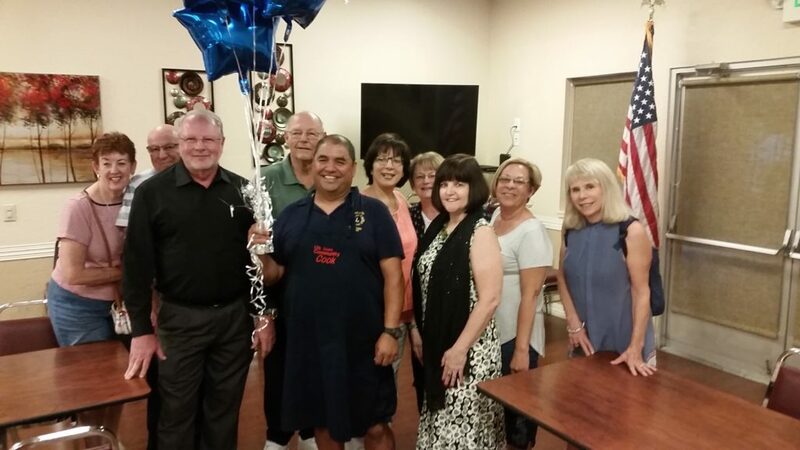 Surprise notification to Lion Pancho Sanchez by (L-R) Marie Coleman, Joe Tallerico, John Shook, Warren Weaver, Pancho Sanchez, April Cooke, Pat Weaver, Tracey Edwards, Paula Maita, Nancy Lucia. The Elk Grove Citizen of the Year is truly a community award. The recipient of the Elk Grove Citizen of the Year award is honored at a banquet held on the first Monday in November each year. The award and banquet are co-sponsored by several local service organizations. Some of the co-sponsors include the Elk Grove Lions Club, Elk Grove Optimist Club, Pride of Laguna Creek Lions Club, Rotary Club of Elk Grove, Rotary Club of Laguna Sunrise and the Soroptimist International of Elk Grove. Over the years, several members of the Elk Grove Lions Club have been selected to receive this honor. Proceeds from this event benefit the Elk Grove Citizen of the Year scholarship which is given to a qualifying high school senior. 1960 – Cantrell Castello, dairyman, involved in many organizations. 2001 – Frances Fite, leader of Rhoads School project, many other groups. 2004 – Stanley Carothers, supporter of many local organizations. 2009 – Frank and Paula Maita, business leaders, city, chamber, and other groups. 2015 – Pat and Warren Weaver, education and agriculture groups, Lions Club, and scholarships. 2016 – Jim and Annaclare Entrican, Elk Grove Historical Society, Native Sons & Daughters of the Golden West. 2017 – Pancho Sanchez, Elk Grove Lions Club and almost any fundraiser that required a cook. What’s happening in your club? What’s happening in your club? Go ahead and do a little bragging! We want to know about your projects and/or fund raising activities. To make your submissions easier ask the Lion in your club that prepares the monthly newsletter to send me your newsletter in Word or Publisher, and then I will extract some interesting tidbits for the Lions Pride. Bottom line is that we want to hear from all our clubs in District 4-C5. Please send your newsletter, articles and/or photos to me by the last day of each month for publication in the Lions Pride. Every issue beginning with August will be published on the 10th. If you miss the end of month deadline for a real good reason (smile), please contact me via email and I will do my best to accommodate your submission.